To Lord Ganesha: The Mornings Gets Best With You! Religion is a vast term. I may not be the right person to answer to the question, what is Religion? and what are your takes on it? Because I have never thought of Religion as something to have your takes on or your perspectives. But A religious person, I would call my self because even though I don’t do complete ceremonial “Worshiping”, I sit in front of the statue of Lord Ganesha and I genuinely pray. I sing the Ganesha Arati (Prayer song). The early morning might be lazy but the only thing that refreshes me is the sound of the prayer song that goes straight to my ear and to my heart and as I close my eyes… I could feel all the negative vibes going out and all I can see is the concentration that I can put into finding the purest part of my soul through the prayer song.The song might be only a praise to Lord Ganesha if you just listen it as any other song…but as I go deep each day listening and really listening to the songs…the words are so pure and rhythmic…the words are the best examples of the best poems…It feels like you are falling into the depths of meaning and slowing grasping the meaning of it all. Its like when you read any philosophy and then re- read again and then re-read again and you feel slowly you are connecting yourself with the Philosopher step by step. 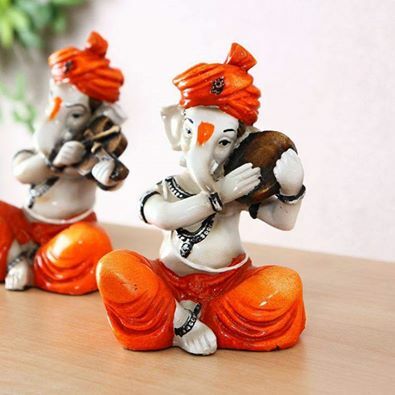 Lord Ganesha- symbol of so many purest things in the world and good luck, for me he is also a Great Philosopher, and each day I get insights from him, I realize the happiness embedded in all the sadness we superficially see in the world, I connect to the world beyond myself and feel enlivened each day. I guess that is all, all the Philosophies in the world that have ever existed tried to say, Life, death, happiness, and sadness in all its complicated or simple ways. The simple prayer song makes me philosophical each morning and teaches me lessons that embroider my view on life in even more beautiful ways. Literature has taught me so many things and I am still a learner. I will forever be thankful to those who have inspired me to write. Lord Ganesha and the morning session with him is the most inspiring of all for me to continue what I do or don’t do in my life. The inspiration is true, innocent and pure, the prayer is humble and from the heart and I promise to continue doing the morning session of prayers for the rest of my life. And thus this is To Lord Ganesha: The Mornings Gets Best With You!